Casey Alexander is glad to return home to Belmont after six years as a rival at Lipscomb University, and is ready to take the program Rick Byrd built and make it his own. Surrounded by his colleagues, friends and family, Alexander embraced the school and community that molded him for 20 years. The Belmont community officially welcomed Casey Alexander as the new men’s basketball coach at a press conference and pep rally in the Curb Event Center on Thursday morning. Alexander talked about getting the opportunity to play under coach Byrd over 20 years ago in front of nearly 200 students, season ticket holders and the non-sweater-vest-wearing former coach. “I took coach Byrd’s very, very small scholarship offer to come be a part of this team with no idea how lucky I would be, almost 30 years later, to stand here today and be recognized as the next head coach,” said Alexander. 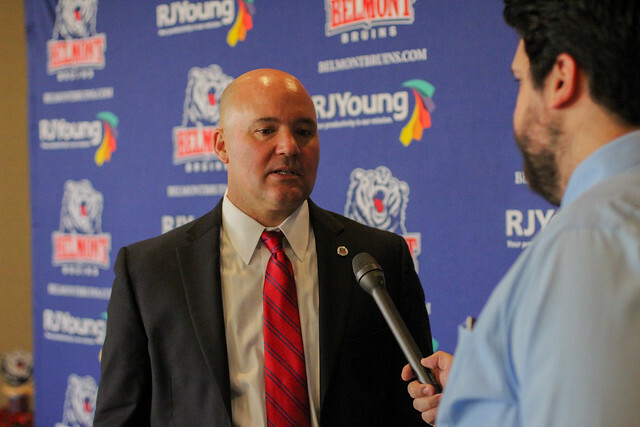 Now as Belmont’s head coach, Alexander has deeper insight into the boulevard rivalry between the school he coached and the one he will coach now. And though Alexander’s coaching style will not be the same as Byrd’s, he said the program is still Byrd’s. Scott Corley, director of athletics, had Alexander in mind from the moment Byrd announced his departure, and was very pleased with how the hiring process turned out. The next step for the Bruins new skipper is to build a coaching staff that can help him win championships. “Quite naturally, I had a coaching staff at Lipscomb that did a heck of a job and are incredibly good and loyal to me, and then I’m very comfortable and knowledgeable of the staff that was here that did the exact same thing,” said Alexander. Brian Ayers, the current Belmont associate head coach, was one of the top head coaching candidates behind Alexander. Both coaches spent 15 years together on Byrd’s coaching staff, so Ayers may be a favorite to stick around. “The reality is there’s essentially eight people for four spots so those are some tough decisions,” Alexander said. Just like building a coaching staff, Alexander has some decisions when building his team. New recruits, like three-star recruit Kaleb Coleman who committed to Lipscomb, would be huge assets for Belmont. But Alexander thinks it’s unlikely. Alexander said he is excited to change that purple and yellow for the red and blue. This article written by Steven Boero. Contributing reporting by Bronte Lebo and Gabby Smedley. Video production by Abigail Bowen and Colby Crosby. Photos by Carina Eudy, Melissa Kriz and Joe Bendekovic.